I salute you, honourable Edain gentlemen. Tidings may have reached your ears that a new LOTR series is in the making, by the busy hands of Amazon Prime. It is reported that Amazon is more than adamant in its will to give life to a colossal masterpiece-series; one that could rival with the likes of Game of Thrones and other recent fantasy classics. 250 million dollars have already been given out to obtain the rights for the materials we all love and cherish; furthermore, they speak of a total amount of 1 billion dollars that the company is ready to invest to ensure that the final five-season project will be a success. And, if we know for sure that sums of that magnitude do not by themselves guarantee a prosperous future, we nonetheless get to assume and somehow predict that great things have been planned with care. 1. Yes, I long to see some solid footage of the Undying Lands from the depth of my heart. Some consistent scenes that are hopefully to be more concrete than nebulous silhouettes, covered by the mists of western seas. A map of those immortal places could do, indeed. 2. One recurrent mistake many people fall prey of is the incorrect belief that Valinor exists as the stereotypical archetype of a paradise; timeless, immersed in perennial light, spaceless and totally abstract. This is not an appropriate portrait, though. The Blessed Realm is not the real Heaven (where Ilúvatar dwells), but is rather meant to represent an Eden-like terrestrial paradise. Aman is in fact an own physical continent, with its relative perilous locations and other geographical particularities. Funnily enough, outside of the Pelóri (out of the evergreen Plains of Valinórë, in the strictest sense), the Immortal Continent harbours some of the deadliest places in Arda (frozen wastelands in the North or dreary strands in the South, with the southern caverns being the one-time grim lair of Ungoliant). So, I want to see a decent degree of differentiation and solidity, rather than a solely-astral, dreamlike portrayal. Sure, Valinor is the most heavenly and holiest realm on earth, full of primeval wonders and unspeakable miracles, yet also differs from the 'heaven-amid-clouds' imagery fixed in the common perception. 3. Reconnecting with the previous point, nowhere in Aman can Men live forever or hope to escape the inexorable passing of time. This is because, as it's stated in the Númenor chapter of the Silmarillion, it's the Immortals who live there that have sanctified those shires, and not the opposite (the Undying Lands conferring immortality to its inhabitants). The latter was a terrible misconception that Sauron used as a potent lever, in order to sway the king towards open rebellion against Valinor, since the monarch yearned for the endless life of Elves and Ainur. This passage might be explored by the series; it has to be, I mean. 4. Because of the series' own setting, all these themes are extremely relevant, now more than ever. In the Third Age, the Ancient West is separated from the world and is therefore not a part of Arda anymore. I imagine it being, in accordance to the canons, a sort of flat, Asgard-like continental mass, floating on forbidden oceans lying in the sidereal ways of Eä (the outer space), whereas Middle-earth and the other territories consisted of a round celestial orb. No wonder why Valinor was thereby deemed an even farther, mystical and mythic reality, as though it had never truly existed. Conversely, in the Second Age Aman was still in Arda and could be normally reached via sailing, had the Valar not barred mortals from taking those routes. Ergo: the Undying Lands were much more real and tangible, back then. 5. 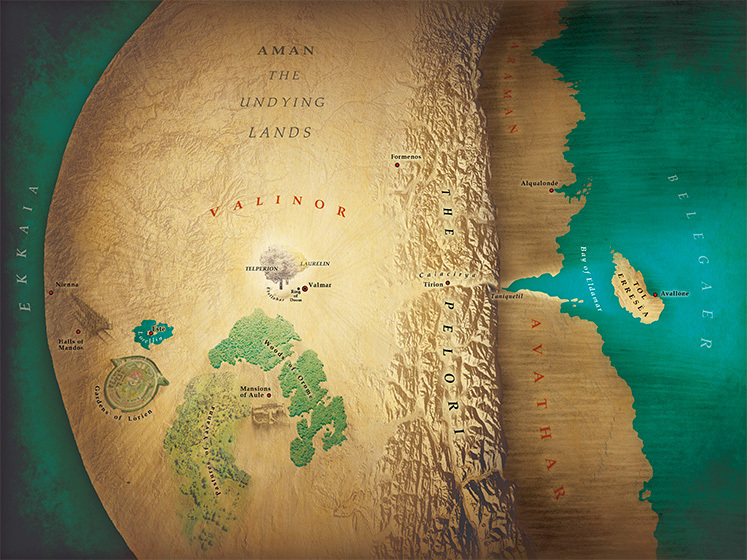 Ar-Pharazôn's landing on Aman is one of the most topical passages of the lore. His huge fleets approached, while the Holy Mountain stood terrible, eternal, imperturbable and unchanged, instilling terror in Men. The king even managed to conquer Eldamar, laying siege to Kôr. The Elves had already fled behind the Pelóri; then, Manwë, from the highest peak, relinquished his delegated powers on Arda, thus temporarily renouncing his dominion of the world. Going through those tense pages, you get the idea that the Valar themselves, beside being unwilling to exterminate the invaders, feared that so formidable an army (the enemy army) could have perhaps brought ruin inside Valinor itself. This gives the idea of the formidable arsenal of Númenor in her prime! The sequence would just be phenomenal to watch, don't you think?